Reminder: Reference Help is Available! Got questions? Need help finding resources for your final projects and papers? We’re here to help! A guide to some basic resources for music research and our library services is also available (as a PDF) at this link (http://bit.ly/MusicRefGuide). We’re happy to help you move forward with your end-of-semester work. Don’t hesitate to contact us! This entry was posted in Consultations, Reference and tagged Consultations, Reference on May 2, 2013 by Nick Patterson. Questions, papers, projects? We’re here to help! And, of course, you’re welcome at any time during our open hours to come to the circulation desk of the Music & Arts Library in 701 Dodge with your questions – just ask for a reference librarian. Don’t hesitate to contact us with your questions, large or small – we love to hear from you! This entry was posted in Circulation, Questions, Reference, Reference Resources and tagged Questions, Reference on April 14, 2012 by Nick Patterson. In addition, the Library will be closed for University Holidays on Monday – Tuesday, 12/26-27, on Monday – Tuesday, 1/2-3, and on Monday, 1/16. Reference and Reserve services continue to be available during these hours, and the Digital Music Lab is open. No items will fall due over the break. Remember you have the option to renew items online, by accessing “My Library Account” on Library Web/CLIO. 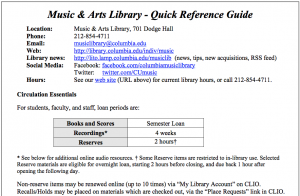 You can contact us at musiclibrary@columbia.edu with any questions or problems. A full schedule of all CU Libraries hours over the Winter Break is available at this link: http://hours.library.columbia.edu. Regular Spring Semester hours will resume on Tuesday, 1/17. Happy Holidays to you all! 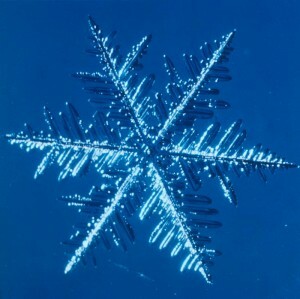 This entry was posted in Digital Music Lab, Hours, Reference and tagged Digital Music Lab, Hours, Reference on December 21, 2011 by Nick Patterson. Crunch time? Research help is available! Hitting the wall? 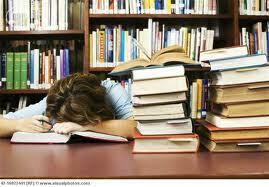 Need a little help with papers and projects? Research help is available! Librarians can help you focus your search, and identify and recommend sources of information on your topics. * Have a question at your fingertips, but need a response right away? Try the “Ask A Librarian” chat service (hours are at this link). If a quick answer can’t be provided, they’ll refer you to a subject specialist. Lastly, for in-depth questions, or help in navigating and using specific resources, schedule a one-on-one consultation with us (email us at the above address). We’re here to help! This entry was posted in Consultations, Reference, Reference Resources and tagged Consultations, Reference, Reference Resources on December 6, 2011 by Nick Patterson. Getting started in the Music & Arts Library, or, need a refresher on some of our resources? Our Quick Reference Guide (link opens as PDF) can help. It contains an overview of contact info, loan periods, resources to help you start your research, music-related databases, and more. In PDF format, with clickable links to the resources mentioned in the document, we hope that this will be a handy guide to help you in your work. Please contact us with any comments or questions at musiclibrary@columbia.edu. This entry was posted in Reference, Tips & Tutorials and tagged Reference, Tips & Tutorials on September 19, 2011 by Nick Patterson. Looking for a little extra research help, as your final papers and projects take shape? Quick Reference Guide: this guide (PDF format) lists some fundamental music research resources to help get you started and is available on our home page, along with links to some other resources. Questions? Please let us know, and good luck with your research! This entry was posted in Questions, Reference, Reference Resources, Tips & Tutorials and tagged Questions, Reference, Reference Resources, Tips & Tutorials on April 25, 2011 by Nick Patterson. Good luck with your research and final projects! This entry was posted in Consultations, Reference, Reference Resources and tagged Consultations, Reference, Reference Resources on December 13, 2010 by Nick Patterson. Looking for a little extra research help, as your papers and projects take shape? This entry was posted in Reference, Reference Resources and tagged Reference, Reference Resources on April 6, 2010 by Nick Patterson. The final push is on!… and here are some reminders of a few music reference resources that may assist you in your work. Please remember that you can contact us by phone (212-854-4711), by email (music@libraries.cul.columbia.edu), or in person during library hours in the Music & Arts Library, 701 Dodge. Please let us know if we can help! Many basic resources are gathered together in our Quick Reference Guide, including print resources, and electronic text and audio databases, and indexes to music periodical literature. Try starting with this, and if you have further questions, don’t hesitate to contact us! Encyclopedia of Popular Music – covers popular music genres and periods from 1900 to the present day, including jazz, country, folk, rap, reggae, techno, musicals, and world music. Garland Encyclopedia of World Music – a comprehensive online resource “devoted to music research of all the world’s peoples”. Each volume contains an overview of a geographic region, a survey of its musical heritage, and a description of specific musical genres, practices, and performances. Music Online: Classical Music Reference Library – “… brings together more than 30,000 pages of essential reference materials, spanning the entire history of Western classical music, in a unified online database. Included are the authoritative reference titles Baker’s Dictionary of Music, Baker’s Biographical Dictionary of Musicians, and Baker’s Student Encyclopedia of Music, which are available for the first time in electronic form”. Opera in Video – database of streaming video of full operas, currently comprising 42 titles. Rock’s Back Pages – rock reviews, articles and interviews from the late 1950s to the present day. This entry was posted in Databases, E-Resources, Recordings, Reference Resources, Tips & Tutorials and tagged Databases, Recordings, Reference, Reference Resources, Tips & Tutorials on December 12, 2008 by Nick Patterson.